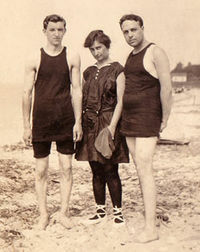 Male and female swimsuits in the United States, circa 1916. William Branham mentions that these visions that he received in 1933 were “Thus Saith the Lord”. The prophecy was written down, so each retelling of it should have been consistent. However, William Branham only mentions this part of the 1993 vision in 1964, when he refers to an article published in Life Magazine that included a photograph of a woman in a transparent gown. The morals of the human race have never been that great, and Americans are no different. The fig-leaf analogy is sensational, but people have been wearing immoral clothing of this type since, well, Adam and Eve. The bikini itself was invented by fashion designer Jacques Heim in Paris in 1946, and was popularized in America long before William Branham mentioned the immorality of American clothing as part of the 1933 prophecy. Furthermore, images of partially-clad and naked women can be found in much ancient art, such as Egyptian art. The Church Age Book includes "women cutting their hair" as part of this prophecy - which is absent from the recorded sermons. If he had this vision in 1933, why would he cut his daughter's hair in the 1950's? William Branham preached against women voting, driving, and cutting their hair. However, his daughters did all of these things. 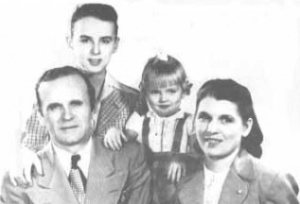 In fact, William and Meda Branham even began trimming their daughter Rebekah's hair before she was old enough to ask for it. Doesn't it matter how you raise your children, especially if you have a catastrophic word from the Lord?